As I’ve not partaken in monthly beauty favourites for a few months, I thought I’d share 4 of my favourite beauty buys, ever. Now whilst it can be hard to find a truly great beauty buy, it didn’t take me long to scour my beauty stash and find the 4 products that would make the cut. They’ve all been repurchased and well loved. Why? Because they’re wonderful and they work. 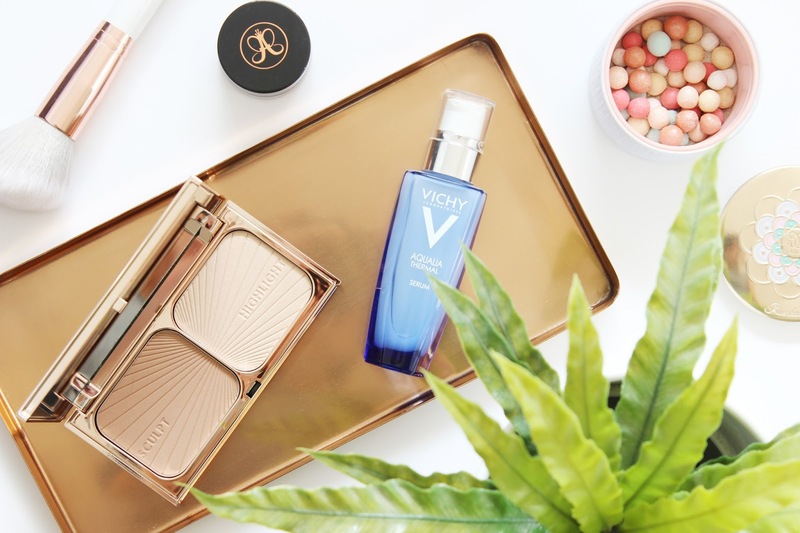 My skincare routine is fairly minimal, but one product in particular that has stood the test of time is Vichy Aqualia Thermal Dynamic Hydration Power Serum. The serum favoured for its simple formulation of Vichy Thermal Spa Water and hyaluronic acid wears beautifully under makeup and moisturiser. It leaves my skin perfectly hydrated, visibly smoother and plump. It’s lightweight in consistency, non-greasy and is a simple skincare solution to help diminish scars and help deliver a healthier hydrated complexion. It can’t be beaten on value either costing under £20. Indulgent and utterly irresistible the Guerlian Meteorites Rainbow Pearls are my favourite finishing powder. Incased in a limited edition porcelain like white and gold trinket, the iconic pearls are magical. With a swirl of a big fluffy brush the different pigments and subtle pearliness work wonders for my skin, leaving it looking perfected and illuminated. The pearls aren’t your traditional highlighter nor oil-absorbing, but breathe life back into my skin and prolong makeup wear. A sheer luxury, but one I couldn’t be without. They’re so good I’ve bought the compact version! Destined to become a cult classic, Charlotte Tilbury’s Filmstar Bronze and Glow double contouring compact is simply da bomb. Packaged in a 1920’s rose gold inspired cigarette case the two powders, one to ‘sculpt’ and one to ‘highlight’ are finely milled and super soft. The ‘sculpt’ powder is made from a pearl pigment blend and is a tad taupey, yet bronzey enough to warm up my complexion. The highlighter is a beautiful golden champagne colour, which isn’t at all metallic, or shimmery and leaves a candlelight glow on my cheekbones. It’s not cheap, but it’s truly treasured. You’ll be hard pressed to find a beauty blogger who doesn’t like Anastasia Beverly Hills brow products. And Anastasia Dipbrow is the brow product that has helped me achieve the ultimate arch. Its formulation is smudge resistant, waterproof and highly pigmented. Initially it's a little challenging to work with, but with a little practice and a decent brow brush, this little pot of joy transforms straggly brows into a statement. There’s a shade for everyone and a little goes a long way. Cara eat your heart out! What's one of your favourite beauty buys?